WHMAutoPilot - Is this Billing System Coming Back to Life? 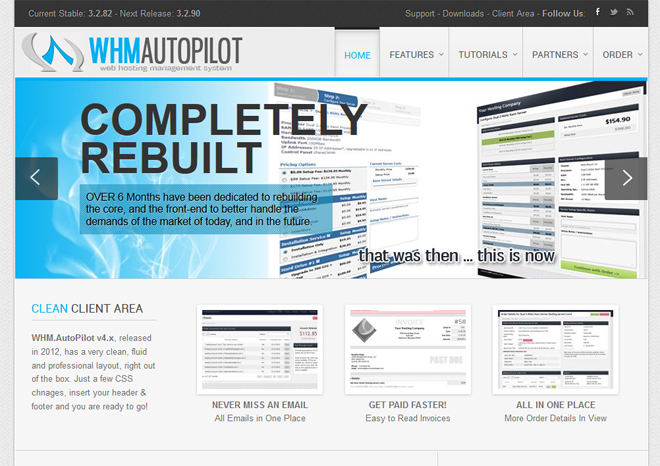 WHMAutoPilot – Is this Billing System Coming Back to Life? WHMAutoPilot and many other billing systems like it are pioneering the market with new innovations and improvements. Companies like WHMCS and ClientExec swooped in and took a lot of the emphasis away from WHMAutoPilot and stole some of the market share with faster, better, and more versatile products. However, the news currently is that WHMAutoPilot is coming back with new improvements of its own. The question remains: will WHMAutoPilot come back, and if so, what types of features will it contain? Will it simply be a rebuilt replica of the former system or will it be rebuilt from the ground up? Additional questions like these have also arisen like can this billing system regain market share even with a vast improvement? Will anyone be willing to purchase a WHMAutoPilot license after its downfall in the billing system market? The fact of the matter is that there are still many unknowns when it comes to the WHMAutoPilot billing system. However, one that that is known is that the owner of WHMAutoPilot, Brandee Diggs, is back on the scene and is taking some action to regain momentum. At LicenseCube, we are rooting for his success and hope to see a new and improved WHMAutoPilot on the market. Let’s hope that he can unleash a masterful product that will allow the WHMAutoPilot license to fly off the shelf. If you are interested in a WHMAutoPilot license, you can contact LicenseCube for further details on any developments. Until the new release, we will be waiting with rapt attention to see if any further new unfolds regarding the rebuilding of WHMAutoPilot. The new release will allow us to look more closely at how the billing system has changed over the years, so that will be able to better ascertain how this program compares to other billing systems like WHMCS and ClientExec. WHMCS and ClientExec have undeniably been leading the market, but we hope to see a more versatile and powerful WHMAutoPilot license on the market soon! We may give WHMAutoPilot a shot for some small projects of ours.